So, I’m working full time now, and life is a juggle. We have a part-time sitter, I’m not spending every afternoon with H anymore. Which is great for her–she gets to run around with a fun college student who does all the fun things she wants to do. And it’s great for me–I work, I use my brain, I love what I’m doing. But I miss those long afternoons with her, and the projects and activities we’d do together. We’re figuring out this new routine, and we are still getting that time in…it’s just often for 10 minutes, and right before bedtime. So I made up this game with black and white Post-Its that I had on hand (I LOVE black and white Post-Its, you would be amazed how pleasant they are to look at and use and how versatile they can be). I had some 12″ x 18″ sheets of craft foam lying around (as you do), and I will recycle the foam to use for another project in the future. 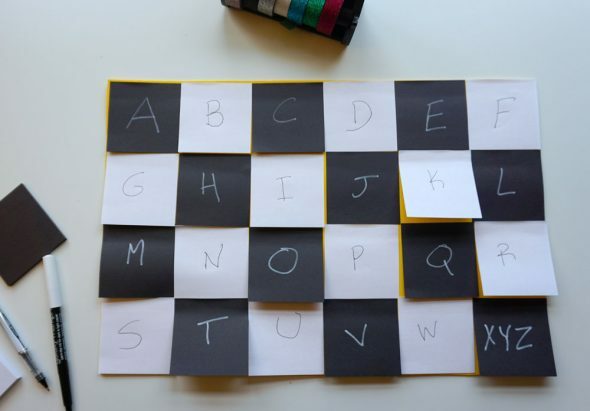 Post-Its are perfect little 3″ squares, so they fit neatly in rows on this board. You could improvise an oversize checkerboard with them, but I was going for more of a Tic Tac Toe idea. And they could be all one color, I just liked the way this looked. Higher contrast, bits of bright yellow peeking out. She was drawn to this board. It’s just fun –it’s not permanent, and it can be changed around for all sorts of games. So I also have lots of 3M Expressions glitter tape that H is always sneaking in my room to use, and it pulls right off of pretty much any surface without damaging it. She picked a color, I picked a color. And then we took turns. You had to name an animal whose name started with the letter you picked, and if you get it right you put a piece of your tape on that letter. The first person to get three letters next to each other wins. 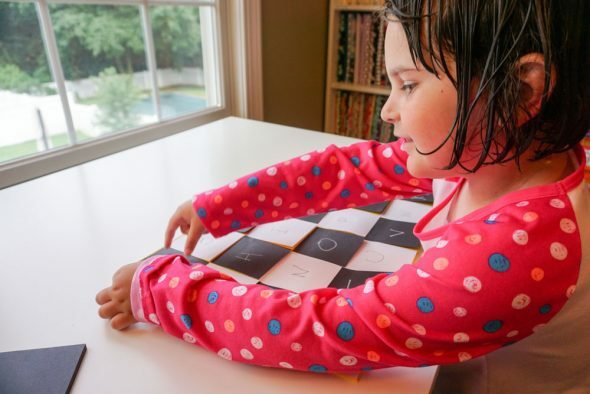 This is a tricky game with a 5-year-old, especially a five-year-old with a serious speech disorder. 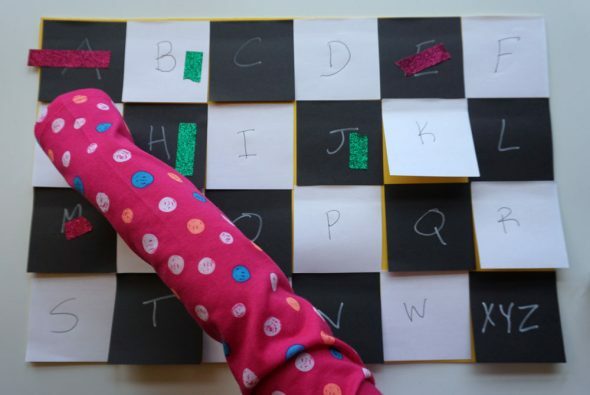 Letter sound associations can be tricky, but this is actually great practice for her. So she needed a little help brainstorming animals that matched the sounds, and I had to give her a pass on a couple (she said “a mouse” for the letter A). But she got the hang of it, and she won. I pulled off the glitter tape so we can reuse the board. 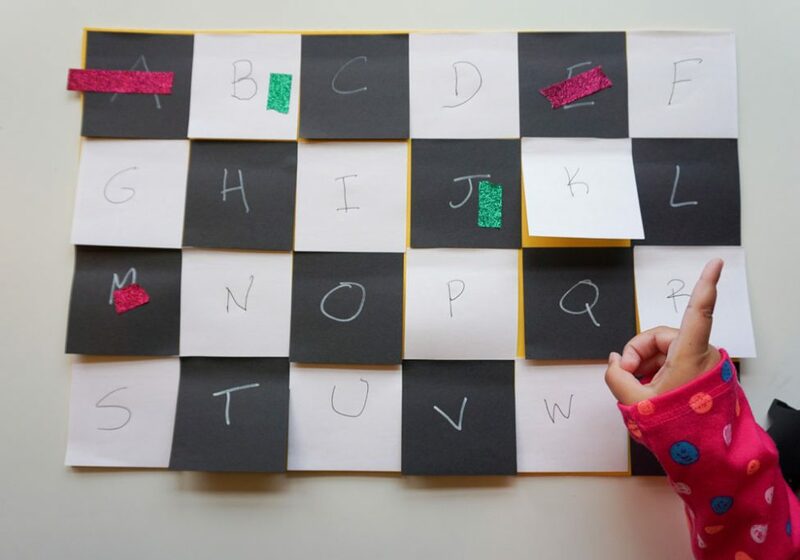 I can scramble the letters to make up another game (like spelling out words), or use Post-Its with something else on them next time. Or just come up with a different set of words, not just animals. But this was really fun, it was great alphabet practice, and we were able to squeeze it in right before bed. It was quick to prep, and quick to play.